The first card of “Messiah Dragon of Rebirth” has been revealed, designed to support Locking and Unlocking. “Dragon King’s Awakening” contains two Special Reprints, “Dragonic Vanquisher” and “Steam Tamer, Arka”. These are vital cards for both of their Decks, so get your hands on them if you can, if you plan to make a “Zodiac Time Beast Deck” or “Vanquisher Deck”. We’ll be introducing Deck Recipes using cards from “Dragon King’s Awakening” today, so be sure to check them out! 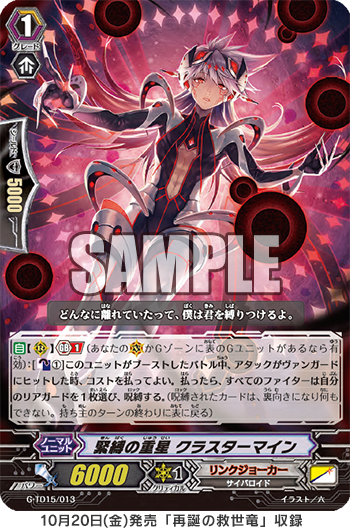 And on top of that, “Binding Multiple Stars, Cluster Mine” from “Messiah Dragon of Rebirth” is a card that supports Messiah, as when an Attack that it Boosts hits a Vanguard, you can pay 1 Counter Blast, to have all Players 【Lock】 1 of their Rear-guards. By 【Unlock】ing a 【Lock】ed card with “Genesis Dragon, Amnesty Dragon, you’ll be able to continuously attack. Use 【Lock】 and continuous attacks to place enormous pressure on the opponent!